There are few greater – and more welcome – signs of Belfast’s rejuvenation as a vibrant, growing city than the arrival of new drink brands proudly celebrating Belfast past and present. From fine whiskey to gin and vodka there’s plenty to enjoy…with an essential new venue for drinks connoisseurs along the way. Here’s our guide to some essential local gems! Among those marking all that’s great about Belfast with high-quality drinks you’ll find Jawbox Gin. Founded by a former bar manager, Jawbox is named after a traditional kitchen sink to mark the fact that in Belfast (old and new!) the kitchen remains a central room for gossip, food and drink! 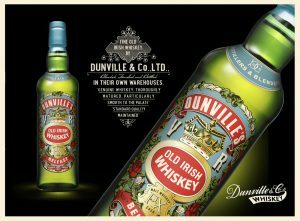 Also, don’t miss the equally stylish local whiskey – Dunville’s – which recalls a beloved old whiskey brand and firmly roots itself in historic Belfast. You’ll find local whiskey brands, like Dunville’s, in the exceptional Friend at Hand shop in the Cathedral Quarter. Opened by famous local publican Willie Jack, the shop features over 600 whiskeys and is a mini museum in its own right. It’s hard to single out two great Belfast bars – you’ll love The Crown, The Garrick, The John Hewitt and many more – but let’s take a look at a newer venue and a more established local favourite. At the Sunflower Bar you’ll find craft beers, live music and a diverse range of regular customers. Meanwhile, across town at the larger Woodworkers bar in South Belfast you can take your pick of ‘beer flights’ in this relatively new tap room. A great choice of whiskey can be found in The Duke of York (Cathedral Quarter), Bittles (close to Victoria Square) and the back bar at House Hotel (Botanic) while extensive gin collections are available in many Belfast bars. The Sagart (Belfast’s smallest bar!) close to the City Centre is an unusual and very worthwhile option too. Tip: For an unusual cocktail experience seek out One Goose Entry (nr Cathedral Quarter) online or The Bear and The Doll close to Union Street. Not a drinker? Seek out Kaffe O in Botanic for great coffee and try your luck in the local charity shops! Hit The Road (or Rail)! Whiskey aficiando? We’ll assume you’ve already considered taking a trip to the celebrated Old Bushmills Distillery near the north coast. But don’t forget the city of Derry in NI’s north-west is home to the award-winning Quiet Man whiskey. Drop them a line about a distillery tour and bear in mind that the train journey to Derry from Belfast follows a famous, stunning shoreline route. For pubs in Derry try the Grand Central – a perfect example of a no-fuss, quality pub – and Sandinos Bar/ Club for a more leftfield alternative.